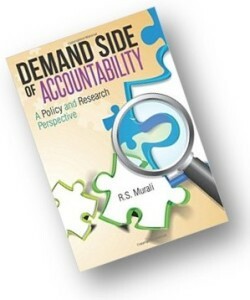 The book ‘Demand Side of Accountability: A Policy and Research Perspective’ by Dr. R. S. Murali was released in August 2015. The book looks at the key issue of accountability in governance today. This book is a culmination of Dr. Murali’s long experience working on governance and accountability reforms. In this book, Dr. Murali examines in detail the demand side of accountability and provides an in-depth analysis of the urban sector in India, taking the case of Chennai City Corporation. The book maps the role of all stakeholders in delivering good governance and delves deep into the role of the citizens in demanding and ensuring accountability. The book introduces the Accountability – Transparency – Actionability (ATA©) model as a useful tool for policy makers as well as researchers and academicians for conceptualizing, implementing, measuring, and evaluating accountability in governance. What makes this book unique is that it looks at accountability from the ‘Demand (service recipient)’ side rather than the ‘Supply (service provider)’ side. The book is published by Notion Press in print as well as electronic versions and is available at all leading bookstores and online marketplaces worldwide.